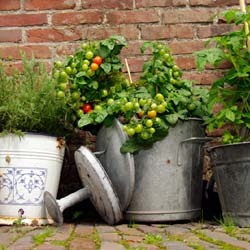 Container Gardening provides many advantages for today’s busy and space challenged gardeners. You can grow just about anything in containers that you can grow in the ground: annuals, perennials, bulbs, ornamental grasses, veggies & herbs, shrubs and even trees. Pots may be may rearranged, as you would furniture indoors, to suit your mood, entertaining needs or the season. Plant light requirement is less of a concern as lightweight planters, or containers on coasters, may be moved to follow the sun pattern. Container gardening brings the garden closer, right outside your door and up off the ground, requiring less bending and kneeling when tending. What could be easier? Do you dream of a delicious, homegrown harvest but don’t have the land to use? No longer should a shortage of garden space prevent you from growing your own fresh vegetables. As long as you have a sunny location you can have your own mini-farm on your porch, patio, deck, balcony, roof-top or doorstep! Vegetables are amazingly ornamental and can be just as decorative as any other container plants or flowers. 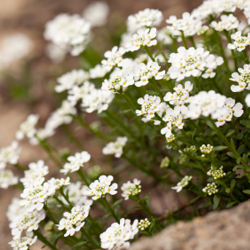 There are fewer problems with pests such as groundhogs, deer and rabbits and soil borne diseases. The soil in pots warms up more quickly in the spring allowing for earlier planting and an extended growing season. Less bending, squatting and kneeling is required for gardeners with limited mobility. Vegetables can be grown in any vessel that can hold soil, has adequate drainage and is large enough to hold a plant. There are endless options available on the market or you may recycle items that you already have as long as they meet these requirements. Use your imagination – try a wheelbarrow, wine barrel or just a plastic bin, and you’re ready to plant! While all veggies can be grown in containers, some are better suited than others. Plants that grow particularly large, that sprawl or that must be grown in large numbers to ensure an adequate yield may take more effort and careful site planning with an adequate container. Similarly, vining plants need not be avoided. Trellis these plants up against a wall or fence or allow them to cascade down from a taller pot or a container placed up high like on a stone wall. For smaller selections, a hanging basket or window box may be used. Many sprawling and vining vegetables are now available by seed in dwarf, compact or bush varieties. These are bred specifically for small spaces and containers and are worth seeking out. Containers: Size matters when planting in containers. The bigger the container, the more soil it can hold. More soil more and more moisture means less watering. Take note that porous containers like terra cotta dry out more quickly and will therefore require more frequent watering. 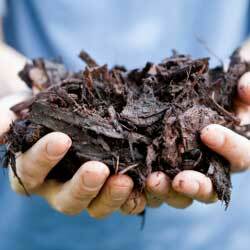 Soil: When planting, choose a good quality potting mix. Soil from the ground may contain insects or disease or may be too heavy. Add an all-purpose balanced fertilizer at time of planting. It is also good idea to mix water absorbing polymers into the soil. These granules can hold up to 400 times their weight in water and help reduce watering from 30-50 percent. Plants: Some of the vegetables that you select may be directly seeded into your container; these would include peas, beans, radishes and corn. With most vegetables you may wish to transplant seedlings into your container, either home-grown or garden center purchased. You will generally find a wider selection of vegetable varieties and unique options available in seed as opposed to purchased seedlings, if you want to use your containers experimentally. Supports: Supports should be placed at time of planting for large or vining plants. This will ensure the young plants are not disturbed or damaged with supports added at a later time. If the supports are outside the container, however, they can be added only when they are needed. Location: Your vegetables will require at least 6 hours of direct sun a day. If this is not possible you may try placing your pots on dollies or carts and moving them to a sunnier location as the sun moves throughout the day. Note that good air circulation is important for disease control. Watering: Test soil frequently for water to make sure that you keep it evenly moist. Water the soil, not the plants, to avoid the spread of disease. Check soil moisture more frequently during the summer months when evaporation is faster. Mulching your containers with salt hay or grass clippings will help keep soil cool during the summer months and reduce the frequency of watering. If possible, a drip system can be a great option for keeping containers watered. 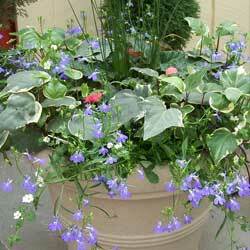 Fertilization: Fertilizer leaches through pots quickly. Fertilize containerized vegetables at least once a week with a water soluble fertilizer. Always be careful to follow the directions on the fertilizer package and follow the recommended rate. Too much fertilizer may burn or kill your plants, but too little will result in undernourished, underperforming plants. With appropriate care that caters to the needs of containers, your small-scale vegetable garden can be just as lush and productive as any larger, more intensive space, and you’ll soon have a bountiful harvest to enjoy. The arrival of spring is evident more in the blossoms of trees than anything else. The joyful coloring of the landscape by spring-flowering trees truly lifts the spirits – the pinks and whites of dogwoods and crabapples, the glorious blossoms of magnolia and ornamental pears that magically appear almost overnight. Together, they proclaim that winter is finally over. Magnolia – The first to bloom is the Star Magnolia with its many petaled, white flowers. A week later several varieties of Saucer Magnolias make their debut with big, rich, full, cup-shaped flowers in shades of white, pink and purple. Ornamental Pear – Smothered with small white flowers, Ornamental Pears also have rich leaf color in late fall. Use as a specimen or accent as well as a street tree. Ornamental Cherry – Every landscape should have at least one cherry tree. The breath-taking Weeping Cherry announces spring’s arrival, followed by the famous Yoshino Cherry of Washington D.C. Next, the popular vase-shaped Kwansan Cherry explodes into bloom with deep pink, double flowers. Redbud – An adaptable tree with charming bright purple flowers along its bare branches. ‘Forest Pansy’ also boasts purplish foliage all summer. This is one of the few trees that will tolerate shade. 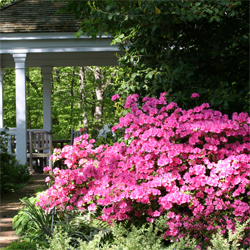 Dogwood – Our native Dogwood is one of the most beautiful flowering trees. Graceful flowers in white, pink and red appear to float on its bare branches. In fall, leaves turn to a reddish purple color with clusters of red berries.